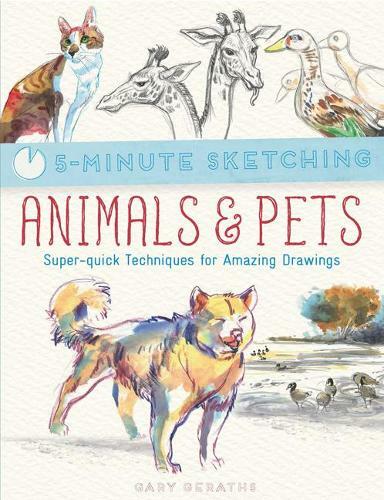 5-Minute Sketching: Animals & Pets contains sixty exercises to help you sketch animals in just 5 minutes. Suitable for both new and aspiring artists, this easy-to-use handbook will loosen up your creativity and help you incorporate drawing into your everyday life. Professional artist and art professor Gary Geraths teaches you how to capture animals in action using bite-sized exercises, each featuring five expert tips, tricks and techniques as well as examples of amazing 5-minute sketches to inspire readers who are short on time. In no time at all you'll be ready to reclaim your sketchbook and produce amazing drawings of animals and pets. Animals are prime candidates for quick working. Rarely still and often found in less than ideal places, the ability to grab a quick sketch while they're visible, or at least reasonably still, is a useful skill. This new series carries great promise and the ideas and techniques here do it full justice. There's plenty of information and variety, with something for everyone. If I have a reservation, it's that the execution perhaps leaves a little to be desired, but there's nothing wrong with the ideas and you'll find plenty to keep you occupied. If finding time for drawing is difficult this new series of 5 minute sketching books will be just the thing. 5-Minute Sketching Animals & Pets by Gary Geraths is similarly inspiring (to the 5 Minute Sketching: Landscapes), packed full of colourful drawings to encourage you to have the confidence to get sketching. "Study your subjects, gather up your pencils and paints and get out sketching as soon as possible to enjoy the whol amazing experience" writes Gary in his introduction. This practical guide shows you how, with 60 exercises to help you sketch animals in just five minutes. The four chapters include Materials and Basic Methods; Pulling the Pieces Together, Fleshing Out Your Sketch; and Materials and Techniques, each with subdivided bite-sized exercises to give confidence and get you sketching regularly. Packed full with useful tips and ideas, the five-minute sketching guides offer invaluable information on sketching with inspiring and lively presentation.